EISA has worked with the African Union Commission and the Pan African Parliament since 2003 and 2007 respectively (see Partnerships). Within the framework of its partnership with the AU, a delegation from EISA paid a courtesy visit to the AU Commissioner for Political Affairs, Her Excellency, Minata Samate Cassouma on Friday the 16 of November, 2018. The EISA delegation was led by Professor John Stremlau, an EISA Board Member. Other members of the delegation were Denis Kadima, Executive Director, Ilona Tip, Operations Director and Olufunto Akinduro, Head of Elections and Political Processes. EISA co-facilitated a series of training workshops organised by the African Union. These included a training of trainers of long term observers, conducted in French, conducted from 20 to 30 April 2016 ; a political and media expert training, conducted in English from 23-27 May 2016 ; and a political and media expert training conducted in French from 28 May to 2 June 2016. Through its participation in these training workshops, EISA contributed once more to increasing the pool of key resource persons with a set of specialised expertise who will be deployed on AU long term missions, and in turn, to the conduct of professional and credible election assessment by the AU. EISA furthermore provided technical support on the use of technology to the AUEOMs in Benin and Ethiopia. The use of handheld tablets for election day data collection and real time data analysis added value to the quality of the assessment done by these missions. The quality and credibility of the statements and reports from these AUEOMs was enhanced by verifiable quantitative statistics.Unfortunately, EISA was unable to provide support on the use of technology to the AUEOM in Togo as the Togolese customs confiscated the handheld tablets at the airport. The AUEOMs have benefited from the use of tablets enabling the AU to provide immediate and up to date election information. EISA also contributed to the publicity and profiling of the AUEOM in Benin by deploying a media consultant as part of its technical support team. Media consultants were not deployed in Togo and Sudan as the AUC deployed communication officers as part of the AUEOM coordination teams. The renewal of EISA's Memorandum of Understanding (MoU) with the African Union Commission (AUC) marked an additional milestone for the partnership that was initiated in 2008. The MoU was renewed for another five years at a signing ceremony in Addis Ababa on 9 June 2014. As part of its capacity strengthening initiatives, EISA hosted a two-day review and training workshop for its staff who are deployed to AUEOMs. Lessons drawn and recommendations from the workshop informed EISA's technical support to the Democracy and Electoral Assistance Unit (DEAU) of the African Union Commission (AUC) throughout the year. EISA technical support teams were deployed to all the AU Election Observer Missions (AUEOMs) deployed in 2014 in the following countries: Algeria, Botswana, Egypt, Guinea Bissau, Malawi, Mauritania, Mauritius, Mozambique, Namibia, Sao Tome and Principe, South Africa and Tunisia. EISA staff attached to AUEOMs provided technical advice to the Mission co-ordination team; facilitated the observer briefing and orientation sessions; supported the use of technology by AUEOMs; contributed to public relations by the AUEOMs; and supported the drafting of key AUEOM statements and reports. In line with EISA's contribution to improving the observation methodology of the AU, EISA introduced the use of technology for data collection and analysis.. The use of computer tablets was piloted with three AUEOMs, namely Malawi, Mozambique and Namibia. Following the successful conduct of the first pilot in the use of technology during the tripartite elections in Malawi, full scale tests were undertaken in Mozambique and Namibia. The use of the tablets made collection and analysis of election day data efficient and timely. The quantitative data collected using the tablets further improved the reporting of the AUEOM. EISA co-facilitated two training workshops for AU long term observers (LTOs) and two training workshops for AU election and legal experts. Through these workshops, EISA contributed to the development of a pool of AU LTOs and experts who will in future serve as core team members on AUEOMs. The linguistic diversity of EISA staff enabled the Institute to deploy Anglophone, Lusophone and Francophone trainers to cater for the needs of specific groups of AU observers and experts. The manual has been published in English and the French and Portuguese versions will be available in early 2015. In June 2014, a team of trainers drawn from the EISA Head Office and its Kenya Field Office joined the facilitators who were drawn from the Democracy and Electoral Assistance Unit of the African Union Commission and the Election Observation and Democratic Support (EODs) Project of the European Union. EISA continued to provide technical support to the Democracy and Electoral Assistance Unit (DEAU) of the African Union Commission (AUC) in the field of election assessment. EISA deployed technical assistance teams to support all the 14 EOMs deployed by the AU in 2013. The EISA team provided technical advice to the EOM coordination team, facilitated the observer briefing and orientation sessions and supported the report drafting committees on these AUEOMs. Beyond the deployment of EISA technical staff, the EISA teams also included a media consultant, who were responsible for the EOM's publicity. Media consultants included in the EISA teams in elections were considered critical in enhancing the visibility of the AU EOMs, which is critical in spreading good electoral practices on the continent. The AU launched its long term election observation during the March 2013 Kenyan elections. EISA contributed to the refining of the AU's election observation methodology through its participation in a validation workshop for its long term observation methodology held in Johannesburg on 30 April and 1 May 2013. EISA also contributed to a methodology review workshop held in Addis in August 2013 at which the methodology for data collection was reviewed. EISA contributed to the development of a new set of checklists for use by AU observers. EISA also finalised the draft Election Observation Manual following the DEAU's approval. In 2012 EISA's experts provided technical assistance to the AU elections observer missions in countries such Algeria, Angola, Burkina Faso, Ghana, Lesotho, Libya and Sierra Leone. This work continues in 2013 with the AU observer missions to Djibuti, Cameroon, Kenya, Madagascar, Mali, Rwanda, Swaziland and Zimbabwe. EISA continued to provide support to the African Union through its election observation missions. This support essentially consisted of training of observers and providing technical assistance to the observer missions' secretariats. It is worth noting that the PAP EOMs have now been integrated into AU EOMs. In 2011 EISA seconded its experts to the African Union (AU) election observer missions to Côte d'Ivoire, Liberia, Nigeria, Uganda and Zambia as well as during the self-determination referendum in South Sudan. After successfully partnering in election observation, the AU and EISA resolved to work together in each and every national election taking place on the continent from 2012 onwards. This arrangement substantially widened the Institute's geographical coverage. The Institute also assisted the AU in increasing its pool of observers through conducting training workshops in Gabon in July 2011 for observers drawn from Central and West Africa and in November 2011 in Tunisia for observers drawn from North Africa. The training in Tunisia was the first of its kind for the Maghreb countries and introduced the participants from North Africa to international best practices in electoral observation. The AU launched its long term election observation during the March 2013 Kenyan elections. EISA contributed to the refining of the AU's election observation methodology through its participation in a validation workshop for its long term observation methodology held in Johannesburg on 30 April and 1 May 2013. EISA also contributed to a methodology review workshop held in Addis in August 2013 at which the methodology for data collection was reviewed. EISA contributed to the development of a new set of checklists for use by AU observers. 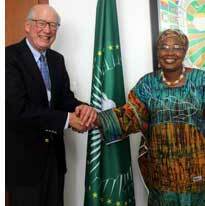 EPP continued to provide support to the African Union in the area of election observation. This support materialised in two ways: support provided to the Democracy and Electoral Assistance Unit (DEAU ) of the African Union Commission and technical assistance and expertise provided to the African Union election observer missions during their deployment. Furthermore, in partnership with the Carter Center (TCC) and the International Foundation for Electoral Systems (IFES ), EISA developed two manuals for the DEAU . The first was designed as a training manual for the AU observers, whereas the second manual focused on the training of DEAU staff in election observer missions' management and co-ordination. During the period under review, the second series of orientation workshops on election observation methodology was conducted for the AU election observers in Dakar, Senegal, from 1 to 3 March 2010, facilitated jointly by EISA, IFES and TCC for DEAU. EISA continued to provide technical assistance to the two pan-African bodies. The assistance consisted of facilitating a training programme on election observation and providing technical assistance in co-ordinating and managing the Pan-African Parliament's election observer mission to Namibia. Furthermore, EISA, in partnership with the Carter Centre (TCC), held the first of a series of training workshops on election observation methodology for 44 African Union election observers in Kenya in September 2009. Based on the Memoranda of Understanding signed with the PAP and the African Union Commission respectively, EISA provided technical support to the two Pan-African bodies. EISA continued to provide technical assistance to the PAP's Secretariat in the area of election observation. The assistance consisted of facilitating a training programme in election observation, establishment of an election unit and logistical and technical assistance in co-ordinating and managing PAP's election observer missions to Zimbabwe, Angola, Swaziland and Ghana. The training was administered to the PAP Members of Parliament who were subsequently deployed to observe elections in the countries mentioned above. In Ghana, the staff from the PAP were able to organise an election observer mission with limited technical support from EISA. This is an achievement for EISA as the purpose of engaging with the PAP was to ensure skills transfer to the PAP support staff and members. EISA also provided direct technical support to the African Union in deploying an observer mission to Zimbabwe. Furthermore, EISA, in collaboration with the International Foundation for Electoral Systems (IFES) and The Carter Center (TCC), took the first steps in supporting the Democracy and Electoral Assistance Unit (DEAU) of the African Union Commission. The support involves compiling a database of election experts and electoral institutions in Africa, producing a manual for DEAU staff on organising election observer missions and compiling handbooks for the training of election observers. The department led EISA's discussions in the formulation of memoranda of understanding (MOU) with the African Union Commission and Pan-African Parliament respectively. Following discussions with these pan-African institutions, a broad MOU was signed with the Pan-African Parliament. Since the signing of the MOU, EISA has provided technical assistance to PAP secretariat in the area of election observation. The assistance consisted of conception and administration of a training programme in election observation, establishment of an election unit and logistical as well as technical assistance in co-ordinating and managing the first ever PAP election observer mission to Kenya. The training has been administered to PAP MPs who will subsequently be deployed to observe various elections on the continent. The African Union Commission and EISA have agreed to the text of an MOU providing for a wide range of areas where the two institutions can forge partnerships aimed at promoting democracy, good governance and credible elections on the continent. EISA assisted the African Union in deploying observation missions to Sierra Leone and Togo.